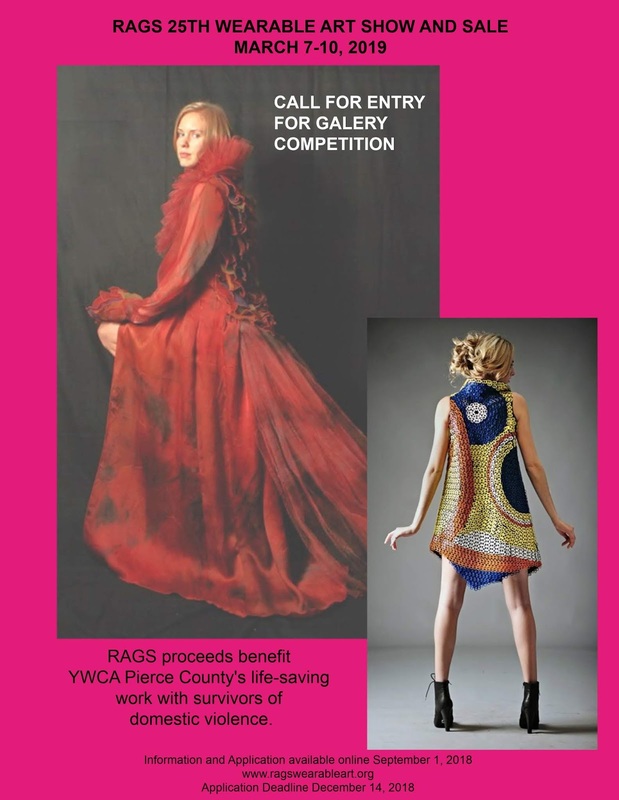 Tacoma, Wash. – The YWCA RAGS Guild announces a call for entries for its 25th annual juried Wearable Art show and Sale. The RAGS 2019 event will take place March 7 – 10, 2019 at Mercedes-Benz of Tacoma. Open to all artists working in all media of wearable art-garments, fashion accessories, and jewelry. · Gallery – competition of one-of-a-kind artist-made pieces ($15 application fee per entry, up to three entries) Gallery entries may be for sale or NFS. All initial entries are juried by digital images. Accepted gallery entries are judged for awards from actual works in late February 2019. Cash prizes to gallery winners in garments, accessories, jewelry, woven wearables and best of show. As a benefit for domestic violence prevention programs of the YWCA Pierce County, RAGS retains 33% of Marketplace sales and 40% of Gallery sales. Deadline for submitting digital images is December 14, 2018. For prospectus, entry information and online application visit www.RAGSWearableArt.org. or send an SASE to Artist Coordinator, YWCA RAGS Guild, 405 Broadway, Tacoma, WA 98402. For more information, call Judith Cunneen or the RAGS hotline at 253-272-4181, ext. 352.